A huge pedal with a huge sound. Complete with enough alien noises to freak out your listeners. Direct crazy intermodulating distortion to make unique music with. The Harmonic Transformer is an extremely loud and intense fuzz pedal which is very interactive with the incoming signal ranging from over the top to bizzare. FANTASTIC! They have to pay their soldering monkeys a few less bananas! Heh. Less than 12 hours after publishing and on the week night :) I think it's going to take at least till 9pm today until this is verified. But definitely, i'm going to build this. Well 1M's are within 10% so I can't imagine them needing to be that accurate. I was just wondering about the intensity switch. If i read this right, INT could be replaced with SPDT by wiring the leads to lugs 1 and 2? Is the SPST On-On or On-Off, or what? And what about the SPDT? I am sorry if this is obvious to others, I can read a schematic fine but I'm not particularly good at working out the purpose of certain things. a SPST Intensity switch can only ever be one thing. It either makes or breaks a contact across two lugs and so has to be 2 position on/off. The SPDT is a 2 position changeover, so it makes the connaction between the centre lugs and one outer lug in both positions. 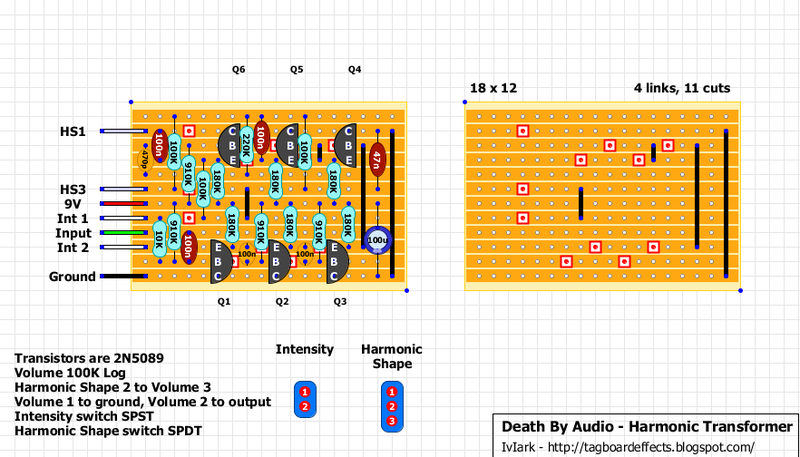 If you look at the schematic in the freestompboxes thread it should all be more obvious. sorry but I could not find the schematic in the net. you have a link for me? I'll do any of them that I can find a schematic for, so I'll keep an eye out for one. Build it, but wouldn't call it verified yet. As i recall, earlier (though verified) DBA layout had problems with zero sustain. Same with this one. This makes me wonder if there's something magic in his builds, since to this day i haven't heard about successful clone of DBA schem. Please correct me, if i'm wrong. I don't think that the fault is in the layout.. So, it sounds like it should, except that the sustain dies before the strings. Only deviations from the layout are 500pF instead of 470pF and 910 resistors are all 820K+82K = 902K, with 5% marginal. This time i knew what to expect.. Sustain seems to die before the strings no matter what the settings are. Switches are working like they should be, and like i said, otherwise it sounds like it should. Few months ago i had similar problems with particular Woolly Mammoth build, and that got fixed by switching Q1 with 2N5088 instead of 2N3904. Being clever, i tried this circuit with 2N3904s, to no avail. Actually that made no difference at all. One is in spotify and has interesting vintage fuzz/chorus sounds and the other. Well. Doesn't. Verified. I have now finished building the pedal and sounds fantastic!! Thanks a lot IvIark!! And thanks for the Rab Fuzz!!! Now it works like it should! First off, i noticed that the sustain doesn't die so easily once i pulled the dc off and let the sound fade. That gave me a clue that the transistors may be getting too much juice, and therefore gating way too early. Swapped those homespun 902Ks to 1M 1% resistors and that got me a little closer. Still the gate kicked in too soon. It was better, but still too ugly. Then i tried 2N5088s, which are just noisier versions of 2N5089s. And blam. The premature gating was gone. This makes the sound a tiny bit noisier and i get some low oscillation, but that just gives more character to the fuzz. Now i'm trying to figure out which i like better, the Meathead with switchable caps or this. There's some level of similarity in their tones... Must admit that i like them both a lot. Thanks Mark ance again for perfect layout. So could i swap the 2n5089's with 2n5088's on my dba supersonic fuzz gun which has the same problem of too little sustain? Definitely worth a try. Design is not very similar, but if you used sockets, it's really easy to try that out. If you try it, please let us know if the premature gating went away. I thought about building that too, but after reading the comments i figured i'd wait until someone else has it working properly. what is definetely the correct transistors? They were 2N5089 in the original, but the number written on the side isn't going to be as important as the actual gain figure. My 2N5088s are listed at 300 - 900 hfe, my 2N5089s are listed at 400 - 1200 and with a slightly better noise figure. So you could quite easily get a 2N5088 that has more gain than a 2N5089. Ideally we need to get the transistors measured out of the original effect and then choose what we use based on those numbers. Hey mirosol, I wonder whether the discussions we've had recently about filter caps could also be affecting this and maybe the other DBA effects I've done layouts for. Have you tried snipping the 100u in this? This may be irrelevant but I've been messing around with the Woolly Mammoth a lot recently and I've noticed that even gain variations of the same model of transistor give big 'gating' differences..even when swapping positions so maybe the transistors in these pedals are meticulously picked to give the right amount of sustain etc? Yes, there must be some sort of measuring to get any sort of consistency based on the problems some people have had making their own. That's why we really need whoever did the trace (or has an original) to get some real numbers from it. To the earlier question.. I think i should try putting 5089s back on and snipping the power filtering... Once i get to it, i'll let you know. Can someone please tell me the difference between the yellow 100n and the brown one. No difference, I just use that symbol when the cap is soldered to consecutive rows because with the other symbol the text is obscured. I tend to use box caps and just bend a leg back and back out again half way down so it's suitable for the 2.5mm pitch. Works like a charm. Thanks a lot. That's only for power filtering - it's there to prevent unwanted noise from unstable or cheap 9V wall warts. I think that removing it will only make this circuit better. Haven't tried it myself yet, but i will.. Here in spain i can't find 2n5089 and the sound isn't completed. Anyone discovered any transistor to use? 2N5088 do work fine. You could try any bipolar NPN in it's place, like 2N3904 or BC549. These two are a bit low on hfe, but might work fine. Check datasheets for approx. 1000 hfe. You can get 2N5089s for 7 cents a piece from tayda. - 5088s are 5 cents a piece at the moment. I snipped the 100µF and tried again with two different batches of 2N5089s. I also tried swapping the places to see if that changes anything. In this design, power filtering does not affect the sound. With 2N5089 it still gates too early, although it's sound is a bit more clearer and clinical. I'm sticking with 2N5088s since those seem to be the only ones that work properly. They are noisier and not as harsh as 2N5089s, but they don't gate too early. This is still your over the top fuzz, even with 5088s. so mirosol... you're saying change 910k resistors with 1M and use 2n5088's? Missed this.. Can't remember the gain readings and those 5088s are soldered in, and i don't feel like severing them. Hfe will of course be a factor. But in my experience with 2N5089s in fuzzes, they always seem to gate earlier than other types. i built this today with 910k resistors and 5089s and pedal has really no sustain. My pedal also starts play at volume 7 of the guitar.Before that has no sound. Can you try 5088s? I think that the transistors are bigger cause of premature gating than the resistors.. I read your post and i ordered them. I`m looking foward to trying them. in solution of it also. Hello there, I had the same problem with sustain as alot of other people described. To get rid of this problem you could just swap Q1 to a 2N5088. I changed all transistors for MPSA18. I like what i have. I left there 910 resistors. But i will try to change Q1 for 2N5088. Using 820+100K resistors could be worth it or should I better simply use 1M resistors ? 1M will work fine. I used those (eventually). I'm a neophyte at building pedals, so I have a question: what does it mean "Volume 1 to ground" and "Volume 2 to output"? Which "ground" and which "output"? 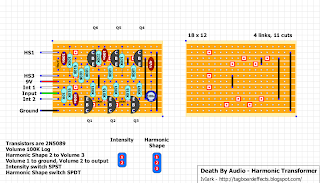 Could someone show me the "guts" of your DIY Harmonic Transformer? so, i finished this pedal up, but... no output, with or without the pedal on, but i get popping when i hit each switch. any idea what i did wrong? I got the same thing. Did you find a solution? Volume 1 (See that link too to know what is "volume 1") must be linked with the black wires on the schematic) and volume 2 goes to the 3pdt in place of the blue cable. could someone post a pcb for this pedal, i've made a few pedals but i`ve never understand how this kind of protoboards work. Thanks! ...or can anyone please tell me what the red dots mean? are they cuts in the paths? thanks mirosol! anyway, is there any pcb layout for this proyect out there? i cant find veroboards here in santiago (chile) and i tried to make one but it didn't work. thanks again! one last question, where is the output in this schem? i have all set up but i cant make the switches and pot make what they should. greetings! Output wire connects to volume pot lug 2. Yes. Just use lugs one and two. Sorry guys (mirosol) but i cant seem to get the offboard wiring working right, im using a 3pdt with the tonepad offboard wiring diagram (http://www.tonepad.com/getFile.asp?id=76 /page 5) but the shape and intensity switches aren't working, shape makes no change in the sound at all, and intensity simply cuts the signal in one of the two positions (no sound), i have all connected just like its explained in the pdf. I might be making the output connection wrong because this board has no output pad as the pdf from tonepad requires. I assumed volume 2 is where the output signal comes from, but im not sure if that is correct. Thanks again for your answers, and sorry for my english. Yes, the output comes from volume pot's lug 2. Those switches are not related to bypass switching. How did you wire them? I wired everything just like in the image from this post, everything is checked. Then i used the offboard wiring diagram from tonepad (page 5 because im using a 3pdt) and connected volume 2 (instead of the OUT in the board) to the 3PDT. I turn the effect on and there is a fuzzed sound coming out but shape and intensity switches are not working and the sustain cuts the signal very quick. Im using 2N5088 in Q1,Q2,Q3,Q4,Q5 and Q6 and 1M resistors instead of 910K. Intensity and harmonic shape switches have nothing to do with that 3PDT - That's for switching the effect between bypass and on. How did you wire those SPDT switches? and you made it using the offboard diagram available in this same site, or the one in tonepad i mentioned? by the way is this blog yours? I understood that you have your bypass switch working? And your problem is with two single pole switches? mirosol, sorry i missed that last reply. thanks a lot, pedal is now working fine and making my synth BIG and noisy. I really dig your work in this blog. Cheers! I built it with 2N5088 instead 2N5089 and...BOOM! Thank you all for tips, especially Mirosol. This is the only change you've made ? I can pass from total mayhem to blistering my ears by flipping a stupid switch: I love It! Followed the layout and everything works except the intensity switch that also simply cuts the sound in one position. Have anyone had this problem ?? Are you sure the bottom left resistor is 10K? apparently some dude on ebay figured out this circuit, cuz he's selling clones with good feedback. anyone got transistor hfe's that work well? HI! First of all, congratulations on your site, it has encouraged me to try some of your projects, actually i had 3 boxes ready and sounding excellent! however, this one is giving me a few issues. I've made the usual wiring (that I know it works, the gaussmarkov one), and it bypasses great. However, the led doesn't light up. It kinda blinks when I stomp the footswitch. And even worse, the effect I can hear, the toggles really change it, but almost no signal from my guitar passes. Just a hint of clean signal if I dime the volume, but the noise is unbearable. Any thoughts about this particular situation? I would like to know if there is a "generic" explanation for the effect working but no signal coming through. im thinking some kind of dpdt onoffon switch between 5088, 2222, and the original 5089 would be an adequate mod. ive built this and judging from vids, its definitely supposed to have that gated flavor. ive noticed with vol on guitar up(bridge emg 81 and a cheap low output humbucker bridge of another guitar) that as long as youre really moving (rock/ dirty punk rhythm or leads) it sounds great and the gating adds for some nice feel as well as some interesting sputter/slight osc/nuance in the mix. when using the 5088 for Q1, it makes it sound more like a distortion hybrid with the sustain taking over quite a bit of the fuzziness, regadless of active or passives. makes for quite a solid metal tone and 2n2222a in Q1 makes it nasally and wild and sounds good for protometal and motorhead. also with searing sustain. i would like to do this mod i spoke of, but to be honest, a transistor soun smack dab between the 5088 and 5089 would be stellar. for the record, after many swaps, im selling this one, finished, with the 5088 in Q1 and mpsa18 in all other sockets. when rolling off the volume and tone knobs on guit, it seems to get me close to what i would want as a customer. sorry for being rather longwinded. hope this is beneficial to some others who might be indecisibe as well. and thanks so much for this wealth of a site. what is the resistance that control the output volume without adding volume pot? Ok, I'm stuck with this one. I don't have any sound coming out of it and have checked everything. Ofcourse, I'm a newbie (second pedaltest) so still figuring out how, what, when to test. Well all the emitters are connected to 9V via 180K resistors, but the only emitter you're getting a significant voltage on is Q5 so something is definitely wrong there. You need to check all those 180K resistors and the 9V wire to make sure you don't have any dodgy joints or shorts. Hi Mark, I checked all 180K's. They are fine. I replaced all 910K to a 1000K value (a more closer value than before). I cut all tracks in between the rows, I checked for cold solders. But all looks fine. The 9V row keeps 9V untill the end. But all other rows have 1V or lower value. I really have no clue whats going on. Any other ideas what it could be? Any suggestions that I could try out? 2) I have a lot of noise going on. Is the cause some bad soldering or is it the effect itself? 3) How to properly measure the volts values? When I turn my guitar volume fully open on the guitar, the volt values seem to change. The Shape switch should be on/on. If you use on/off/on in the middle position nothing is being sent to the volume pot and so no output at all. I haven't built this and aren't likely to, how do you think it sounds compared to the vids? Ok, so that's working okay than. About the sound; it's quite a brutal pedal :) Compared to the video the build has more noise/hum depending on which position you choose (but I havent boxed it yet, so that might explain the hum as well). I haven't played a lot to discover the different sounds, but I really like it to just play around. Don't know if I'm ever going to use it live or on recordings. The sound cuts off pretty soon, so there's (almost) no sustain. The difference between Harmonic and Intensity is hearable, but it's more like a treble versus bass option. Conclusion: a fun pedal to get some extreme fuzz sound out of your guitar. I use a 2N5088 for Q1, and 1M resistors instead of 910k. Thanks Iviark for this Layout ! For the "hum problem". I put a filter between the DC in and the board, and I have much less noise. Sound very close to the video. Can you explain how you built the filter, Thelonius? I built mine using all 2N5088's. It was too noisy to be usable when not playng notes. So I tried the Huminator. Thanks for that suggestion. It didn't end up cleaning up the hum and overall noisiness that much. So I started just replacing the 2N5088's (except for Q1) with 2N5089's. Now the effect is perfectly silent when I take my hands off the strings. However, the sustain was gone. Then I decided to try Q1-Q3 2N5088, Q4-Q6 2N5089. Seems really perfect to me now. I get the nice sustain and no hum or noise. Thanks to everyone who offered these very helpful mod suggestions. Nobody probably cares about this build anymore, but I built it and love it. The 470p input cap makes the one switch setting sound horribly tinny and weak to me, so I threw an 860p and a 10n on a switch in that spot, sounds so much better. I used 2n5088 just like everyone else, and 1megs. It sounds huge. Thanks for the build! Definatly not dead. I did an a/b with two builds, one with the original schematics values and the other by changing the 910k resistors to 1m didnt have a 860pcap so i used a 820p and the 10n and much much better. Oh also with 5088's have a ton of em. Love the changes, delicious sounding. What exactly the intensity and harmonic switches are doing in the circuit? is the intensity switch basically adding a 10K resistor between the E-B or the first q1? I just finished building this and everything works fine except the harmonic shape switch. I only get sound from one of the positions, does anyone have any ideas what could be causing this? I've looked over the board and connections and as far as I can tell everything seems to be in the right spot.